Based in Paphos on Cyprus’ south west coast, this break in the winter sun offers a few days of relaxed exploration far removed from the British weather, and includes three wonderful excursions. Join us to discover Paphos’ fascinating past on a guided walking tour, explore the snow-capped Troodos Mountains, and visit lively, lovely Limassol. Dates and prices published on this page are for the departures flying from Edinburgh only. Flights also available from other UK airports – Birmingham, Bristol, East Midlands, London Gatwick, Livepool John Lennon, London Luton, Manchester, Newcastle & London Stansted – click here for more information on available dates and prices. Today’s included half-day guided walking tour of Paphos will reveal the extraordinary ‘Tombs of the Kings’ burial site, the famous Paphos Mosaics housed in ancient Roman villas, and the Byzantine Church of Ayia Paraskevi. There will also be an entertaining stop to see how Loukoumi – the Greek Cypriot version of Turkish Delight – is made. Stop in Omodos, a pretty village of white stone buildings that is known for its wine production, see Throni Park, the burial place of Archbishop Makarios, Cyprus’ first president, and visit ancient Kykkos Monastery, famed for its Byzantine Museum, mosaics and frescoes. Today’s fascinating optional excursion visits historic Nicosia, the island capital for more than 12 centuries. Divided in 1974 by the ‘Green Line’ separating Greek and Turkish Cypriot territories, the city is both a bustling metropolis with a sophisticated cafe culture, and a fascinating gateway to the island’s turbulent past. Relax in Paphos today. In addition to your hotel’s facilities, the town has sights to see, shops to discover, and even nearby golf courses to tempt the energetic. 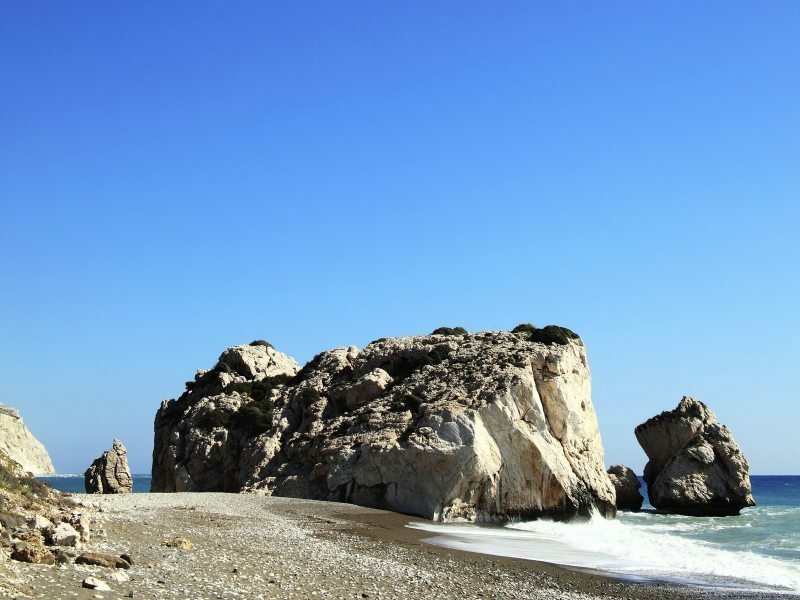 Today begins with a visit to the glorious beach that is home to Petra tou Romiou, Aphrodite’s Rock, where the goddess of love is said to have risen from the waves. From here we’ll head east along the coast to the ancient ruins of Kourion, where a magnificent Second-Century BC Greco-Roman theatre that is still in use today, sits spectacularly atop the cliffs. Your next stop will be Limassol. Here a guided tour will reveal the fascinating sights, excellent shopping, and compact Old City – home to a picturesque fishing harbour and yachting marina – of this bustling city and centre of the Cypriot wine industry. Stroll through the streets of the Turkish Quarter surrounding the Castle in search of the historic Grand Mosque and the traditional hammam bath houses that still operate here.